This year's summer festival season is going fast, as evidenced by the fact that 2018 lineups are already surfacing. For example, Gem & Jam Festival out of Tucson, Arizona, which just announced its funk-heavy phase one roster of artists at its 12th annual gathering next year. And there's a lot to look forward to at Gem & Jam 2018. 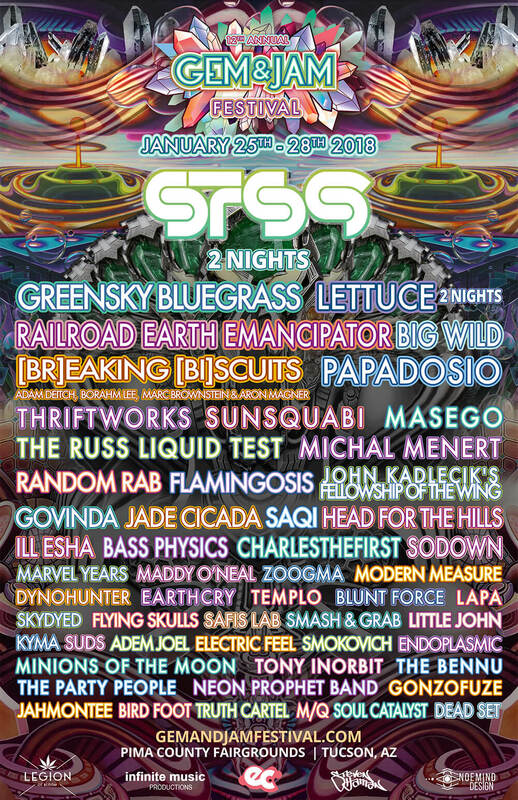 Topping the bill is a double dose of STS9, two nights of Lettuce, Greensky Bluegrass, Railroad Earth, Emancipator and Breaking Biscuits (featuring members of the Disco Biscuits and Break Science). Other exciting performances will come courtesy of Random Rab, Thriftworks, and Govinda. With a lineup this stacked, it's hard to imagine what more could be added – but fresh additions will be announced in the coming months. Emerging from a successful year which saw Gem & Jam embrace the full festival experience with a move from Downtown Tucson to a venue that offered a desert setting with expanded amenities including camping, the twelfth annual event will be a chance for the fest to further spread its wings. Returning to Pima County Fairgrounds for a second straight year, January 25-28, 2018, Gem & Jam shows no signs of slowing down by attracting some of the biggest talent from the scene. To get you pumped and primed, we put together a Spotify playlist featuring our favorite songs by artists from Gem & Jam's 2018 lineup. Jam on it below. Be sure to check out Everfest's Spotify for more lineup playlists, with new ones added every week!